we are jumping ahead a few months! Now if you know me, you know I am loving this late summer surge of 90 degree weather! Bring it on! This "ickiness" will be here soon enough! However, my good friend Robbie, who came up with this week's theme, is taunting me with this Holiday stuff! lol So I'm jumping in with both feet-or boots I guess I should say! Holiday Catalog! 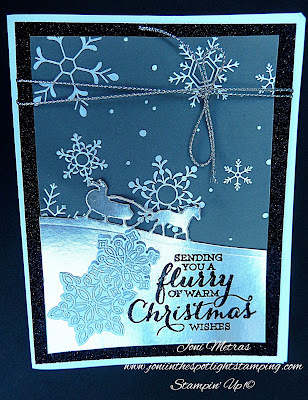 The sentiment is from Flurry of Wishes-it's heat embossed on the Silver Foil Sheet! A bit challenging I must say- embossing on the foil, but just be patient for it to dry! 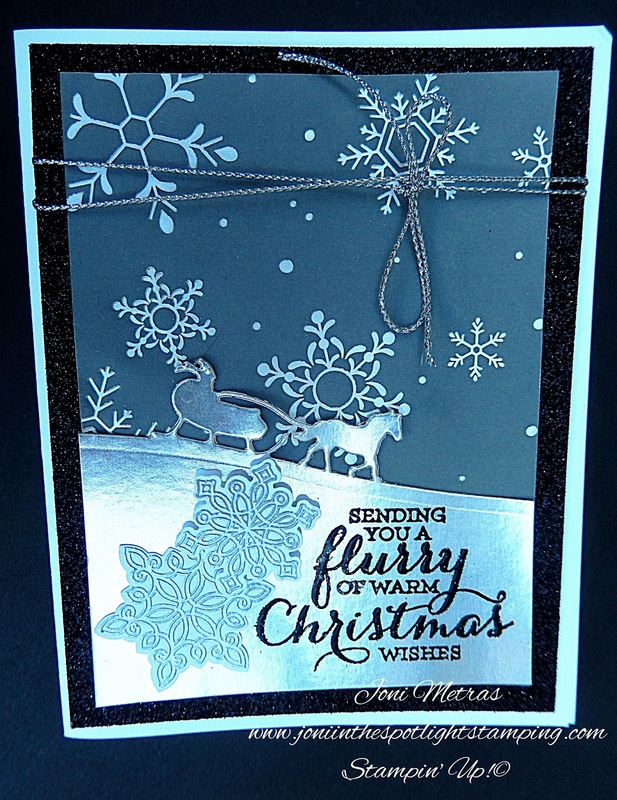 The snowflakes are from the same set-embossed in Silver and punched out with the coordinating Snowflake Punch! The very background is the super cool Black Glimmer Paper! I can see so many uses for this!!! Love it! It's not just for Halloween! Kinda looks like night time here! Holiday Vellum Fancy Foil Designer Pack! Love this pack! The beautiful "sleigh ride" was cut using the brandy new Sleigh Ride Edgelits! They make quite a pop on your card! There are 2 other cool dies in that pack, but I'll keep those a surprise for you! Lastly, the card is wrapped in the very cool Silver Cording-comes in Gold too! Tons of it on the roll, and so easy to use! Great for bows!!! So hop over to The Paper Plunge now & see what other early Christmas inspiration the amazing designers have for you! Love this card, Joni. I think I'm going to case it. Nice!